Taipei, Taiwan: Students and Nationals living in Taiwan came together this past weekend to commemorate the 33rd Anniversary of the Independence of Saint Kitts and Nevis. At the invitation of the Embassy of Saint Kitts and Nevis in the Republic of China (Taiwan), citizens of the Federation braved the inclement weather on Saturday to attend a buffet lunch hosted by the Embassy, at the Regent Hotel in Taipei. H.E. 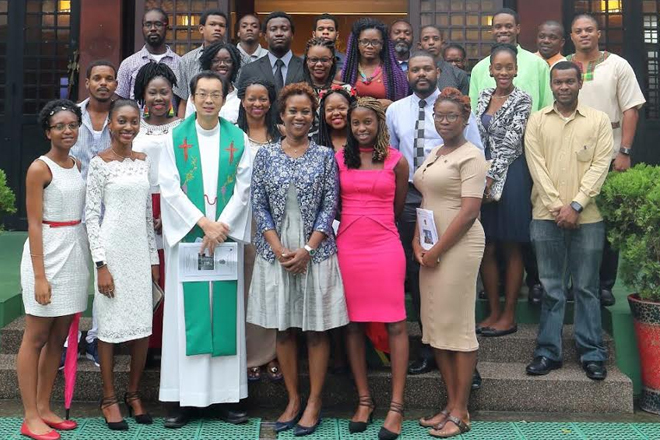 Ambassador Jasmine Huggins used the occasion to welcome the new students to Taiwan and reminded all that their presence and educational opportunities in Taiwan were directly related to the attainment of Independence 33 years ago and the establishment of diplomatic relations between Saint Kitts and Nevis and Taiwan. Two students from the Federation, Ms. Rolhensha Henry and Ms. Natasha Maynard, gave a moving rendition of a medley of hymns that included “Tis so sweet to trust in Jesus” and “Lift every voice and sing” while Mr. Stephen Richards, also a University student, captivated the congregation with a lively performance on the steel pans. Fellow Ambassadors of the Diplomatic Corps and Representatives of Foreign and Trade offices in Taipei from several regions around the world, including Europe, Africa, South Pacific and Asia, as well as other officials in the Ministry of Foreign Affairs of Taiwan attended the event. The service was also attended by two former Ambassadors of the Republic of China (Taiwan), to Saint Kitts and Nevis, H.E. Ambassador Miguel Tsao, Director General of the Department of Latin American and Caribbean Affairs and Mrs. Marietta Liao who has retired from the Foreign Service.